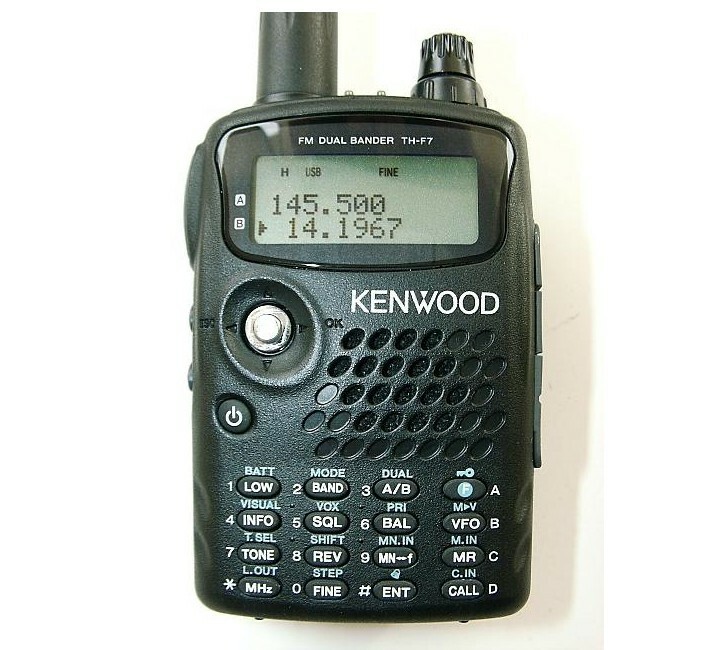 The Kenwood TH-F6 is very compact handheld three band transceiver for radio amateurs. It can be MARS modified, allowing extended transmit ranges. The radio is NOT type accepted for commercial use. The radio comes with a reasonable sized battery pack, a wall charger, and no case. I’d recommend getting a larger Battery Pack, there are some really large packs available. The Kenwood TH-F6 has a power saver feature, which basically turns the radio off for some many milliseconds every second. This is a nice feature, but if it is in power save mode, you will miss the first word of a new call. This feature is well worth the few missed words as opposed to losing the radio to a dead battery. Sometimes it will refuse to turn on. I believe this only happens if you let the battery get really really dead. Other than when I let the radio die, I do not see the problem. This appears to not be specific to my radio only. I see comments on the Yahoo Kenwood TH-F6 group indicating some others having this problem as well. If you replace the antenna with an aftermarket antenna make sure it has a wide base covering the area around the connector at the top of the radio. If you don’t, you run a pretty good chance of breaking off the connector on the radio body. Again, see the Yahoo group for more information on this. Without a good low band antenna it is a brick! If you don’t give it a good external antenna while using it for SWLing, (yes you can do this), the radio is a brick and hears nothing, or almost nothing. If you give it a good external antenna, it suddenly sounds pretty good. This seems to not affect the performance on the AM broadcast band. The stock battery pack does not come with external charge pins, thus, you will have to dismount the battery to charge it in an external charger, or plug the radio into the Kenwood supplied wall bug charger. I thought this would be a royal pain, but it really is not. If you get a few additional battery packs, you just swap them out if you also get an external pack charger. While the radio is on charge, you can not transmit. That is why you want to get additional battery packs, and an external pack charger. I have seen one TH-F6 in which keypad was becoming disfigured from use. The keypad is a rubber overlay, which appears to be painted on a white backing. As wear happens, the white begins to show through. This happened on a radio which was kept in the much too tight after market case. The after market case from Kenwood is so tight it almost does not fit! Not kidding, I thought I was going to split the canvas case open getting the radio in it the first time. The case does not stretch, nor does it even fit the radio well, so don’t even bother to buy the canvas case. I have not seen a leather case for it, so expect to use the radio without the case. I suspect this is why the keypad was wearing so badly in the one radio I saw which had the keypad issue mentioned above. The menuing is a bit complex, but very learnable, unlike other radios I have seen. You should get one of those nifty instruction cards for the radio. This is a small radio, by small I mean really small, it will fit in your shirt pocket with room to spare. I really like the size, it is 2.3 x 3.5 x1.3, and weighs in at 9 ounces. It is very light weight, but does not feel cheap at all. In fact it feels really solid. The Kenwood battery packs remove very easily, and are mounted securely as well. The dials on top are split, so it is fairly simple to operate the radio from the dials. Adding external Mic and Speaker is simple, there are several after market headsets designed for this radio. They all plug into a connector on the side. The MARS extended transmit mod is really simple, and almost anyone can perform it. The radio is easy to use, and programmable via a computer. Once programmed, the radio is really easy to use, and it allows Alphanumeric labels on the dial. It does SSB!! Yes, you can listen to your favorite low band net with this radio. You will need an external antenna for 100 KHz. to 1300 MHz., (cell blocked), but you need one for your big expensive transceiver, so this is not surprising. It also does both the AM and FM broadcast bands, without an external antenna. Given I have this radio for SAR/MARS/EMCOM use, I find those features very good to have. The radio has a built in ferrite bar antenna for use in the AM broadcast band. The antenna is allowed to work for 80-10 Meters, but the built in antenna really does not work well for anything other than the AM broadcast band. Twin radios in one. The radio has two band, and you can listen on either, or both at the same time. VOX for use with those after market headsets you will want. Keyboard lock, this is very useful on a radio this small. Three power levels, 5 Watts, .5 Watts, and .05 Watts. Great for when you are under the repeater; select .05 watts and your battery will never run down. Front panel selectable, using a single button. The radio has an amazing receive range: 100 KHz., to 1300 MHz. Cell frequency’s are blocked of course. I removed the belt clip from my radio for some reason that escapes me now. I also use the radio for RFI hunting, couple it to a short 2 meter beam, put it in AM mode, and you have a wonderful RFI locating machine. 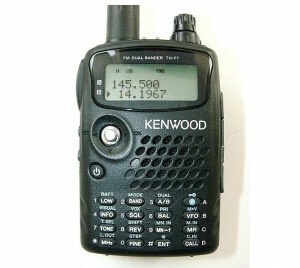 The Kenwood TH-F6 is a fine addition to any ham shack, and seems to be very durable. I have had mine for four or five years now, and still love it. I now also own a pair of UV5Rs, which I use when I worry I will harm the TH-F6, i.e. when on a tower, in the rain, etc… They are throw away rigs, while the Kenwood is my main rig for 2 meter portable use. I have used it to listen to Fire, Police, Weather, Ham, and just about anything else I could think of. Using the dual radio feature, you can listen to an emergency service, while also listening to your local repeater. This makes it a very small package, for doing a number of very important functions during EMCOM activities. Would I buy the radio again, no question. In fact I am considering buying a second one as backup.